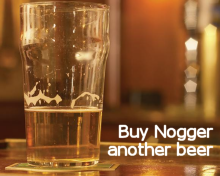 See if you can beat Nogger's score of 1,232 to win a prize. At 11.40GMT sterling was down to $1.5415 against the dollar and set a fresh low against the euro of 1.0926, with one euro climbing to 91.55 pence. More heavy rain in NSW is leading to further quality downgrades for wheat, although aiding the outlook for a promising sorghum crop in 2009. 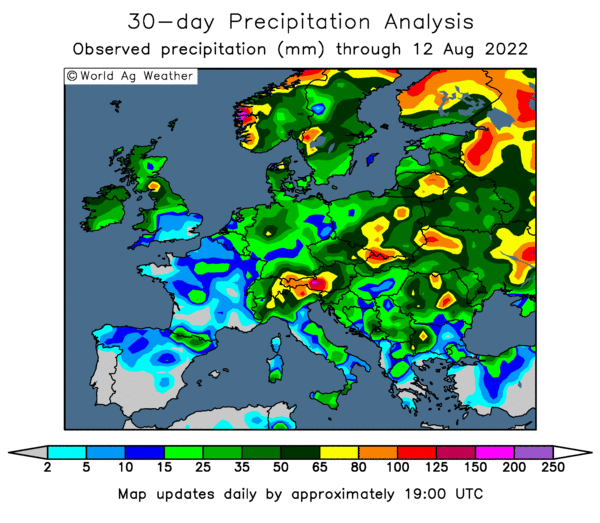 Each of the three major rain events in the past month have led to further downgrading of what had been a promising wheat crop, according to one trader. "A lot of it was durum. That's been dominating the market for some time," he said. "The estimates are that there's probably one to 1.3 million tonnes of downgraded wheat either feed wheat or AH Nine Wheat in northern NSW. It's an unfortunate situation." But he says it is a different story for summer crop growers, with sorghum heading for its second big season in a row. "It's in extremely good condition with all this rain and the mild temperatures. It's ideal for sorghum," he said. Did they leave it on the bus? Shares in BNP Paribas fell sharply in early trade Wednesday after the firm issued a statement saying that it's investment banking division has lost EUR710 million in the first 11 months of the year. The bank had previously said that in the first nine months of the year, the same unit had recorded a pretax PROFIT of EUR879 million. That adds up to a whopping loss of almost EUR1.6 billion in October and November alone! EUR350 million of that is accounted for by exposure to the Madoff scam, but where has the rest of it been lost? And what are December's figures going to look like? At 9.30am GMT, shares in BNP Paribas were down 16.71% at 34.44. The Fed slashed US interest rates to just 0.25% last night in a further effort to stimulate a flagging economy. What's it got left in it's armoury after that though? The pound is up to $1.56, it's best against the dollar in more than a month. The downwards decline continues against the euro though, setting an all-time low for the eight consecutive day. Today's magic number is 1.1031, or one euro equal to 90.68 pence, and we trade very close to those levels right now at 9am GMT. eCBOT is higher, as you might expect with a sharply weaker dollar, with beans around 11-12c higher and corn and wheat both in the region of 6c firmer. Good demand from China, and hopes that a weak currency will improve export competitiveness are behind the rally. Chinese soybean futures settled 1.3% higher overnight as the government continues to support domestic prices with a program to buy up to 3mmt from local farmers. This is turn is supporting US prices as Chinese crushers turn to them for cheaper supplies. Year-end holiday short-covering is also a short-term supportive feature. Taiwan bought 56,030mt US wheat overnight, Japan are expected to confirm a purchase of US/Canadian wheat today. South Korea bought 110,000 Brazilian soybeans. Crude oil is almost a dollar firmer at $44.52/barrel ahead of the OPEC meeting in Algeria where some hefty production cuts are expected to be formally announced. The producer group will probably trim production by 2 million barrels a day at the beginning of next year, Saudi Arabia’s oil minister has said. Russia, a non-OPEC member and the world’s second-largest crude exporter, may also cut output by as much as 400,000 barrels, according to Kuwait’s oil minister. US stocks data, due out later this afternoon, will probably show inventories of crude, gasoline and distillates all rising last week, analysts say. The FTSE100, DAX and CAC40 are all down 1-1.5% in early European trade. The latest UK unemployment figures, due later, are expected to show that the slowing economy has taken its toll on the jobs market. The number of people out of work hit 1.82 million in the three months to September and is likely to reach two million in the coming months. The US Federal Reserve has slashed its key interest rate from 1% to a range of between zero and 0.25% as it battles the country's recession. In its statement, the Federal Reserve warned that "the outlook for economic activity has weakened further". It predicted that rates would stay at the current exceptionally low levels "for some time". However, equity analysts said that the early rally on Wall Street might not necessarily follow through on to European stock markets on Wednesday morning and in coming sessions. The pound rose to $1.56 in late-night trade against the dollar, but fell against the euro to 1.1083. EU wheat futures closed higher in quiet pre-Christmas trade. Paris March milling wheat closed up EUR2.25 at EUR130.50/tonne. London May feed wheat ended up GBP1.50 at GBP100/tonne, with just 63 lots moved. Various scattered tenders seem unlikely to make much difference to the wheat market at the moment. Japan is in for a routine 62,000mt US/Canadian wheat. Iraq is looking for 50,000mt optional origin wheat. Pakistan may, however, buy up to 500,000mt optional origin milling wheat this side of Christmas. With the Russian ruble and Ukraine hryvnia about as popular as a wicker chair in a nudist colony there won't be too many surprises as to the favourites for these tenders. These guys want/need the foreign currency. Severely cold weather in the US plains may be causing some winterkill to wheat crops without a protective snow cover. 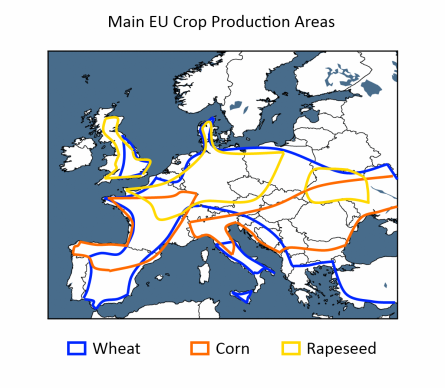 The EU crop for 2009 is in the ground in generally less than ideal conditions. Lack of credit is the main hurdle in Eastern Europe, with price the biggest problem in the west. The French and German crops have been planted in a similar area to 2008, but the jury is still out on final yield. Apart from these two, next season's output is already expected lower, in some cases significantly so. Corn futures rallied nearly 20 cents Tuesday pushing all but front month Mar past the $4/bu. barrier. US dollar continues to slide, reaching its lowest level since the first week of Oct '08, which was in the midst of the rally from the summer lows. 2009 production concerns are a major topic of late and helped to underpin the rallies in corn futures as corn gains on soybeans. Crude oil was steady for the most part during trade and helped to underpin ideas of higher corn and to sustain rallies. Long time shorts may be covering positions and adding additional price inclines. Mar +18 at 3.94. Soybeans closed slightly higher than their midday prices, withholding their gains. Beans are giving ground on the corn:soybean price ratio. Soybeans also have some bearish fundamentals to face, as farmers may be more inclined to plant more bean acres this spring as it is more economic than corn for input cost wise along with rotation concerns. OPEC could announce production cuts tomorrow, which would be supportive to crude oil along with soybeans. Drought concerns still overhang in South America and could help boost US prices and world stock are already tight. Jan +12 at 8.58; Jan Meal +4.20 at 261.00; Jan BO +80 at 31.35. Wheat futures shot higher on short covering and a softer tone in the US dollar. Wheat futures were also able to sustain gains on spillover buying and support from higher CBOT grains Tuesday. Declines in the US dollar has sparked some foreign interest as Taiwan purchased 56,030MT of US wheat, Japan is seeking a buy of 62,000 MT and Saudi Arabia is reportedly interested in a large tender of US milling wheat. The severe temperatures have raised some winter kill concerns, giving bulls some fresh bullish news. Mar CHI +24 at 5.44; Mar KC +22 at 5.65; Mar MLPS +18 at 6.07. Microsoft have taken the unprecedented step of warning users of Internet Explorer to switch to another broweser such as Firefox whilst it creates a patch for a serious flaw in IE which allows hackers to steal personal information such as passwords etc as you type them in. It seems that the hack has largely been used to steal computer gamers details and not for anything far more serious. Yet. I was reading a story the other day about a Trojan that lies dormant in your computer waiting for you to enter certain sites eg. a bank. Once you type in www.lloydstsb.com or whatever in your browser it springs into life, closing the real bank website & replacing it with a cloned one. You type in your password & username etc, it says "sorry we are experiencing technical difficulties, come back in a few hours." Meanwhile now armed with all your details some bugger is straight into your account to empty the lot. Nice eh? Italy is experiencing heavy rains for more than a week, causing heavy flooding of many wheat fields in the country. In some areas where sown fields have been flooded, sowing would have to start anew, farmers said. "We will have delays in the sowing campaign. Moreover, we will have a drop in sown areas and a drop in output," Lorenzo Bazzana, analyst at Italy's biggest farmers association Coldiretti, told Reuters. Even where fields have not been sown yet, it would take a while for the land to dry enough for tractors and other machinery to move in, causing further delays in the campaign, Bazzana said. 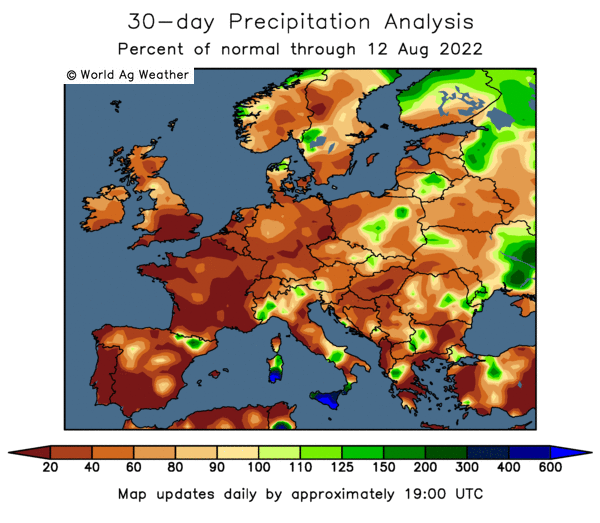 He said it was too early to give precise forecasts because rains continued across Italy. French police acting on a tip-off discovered dynamite hidden in leading Pais department store Printemps today. The explosives were found in the third floor restroom of the menswear department. French news agency Agence France-Presse said it received a letter Tuesday morning from a group calling itself the Afghan Revolutionary Front saying that several bombs had been planted in the store. In the letter, the group demanded the withdrawal of French troops from Afghanistan. Following the discovery, French President Nicolas Sarkozy, officially raised the country's terror alert from "RUN" to "HIDE". It's all kicking off in Bulgaria after satellite monitoring revealed that land that some Bulgarian farmers were claiming set-aside for turned out to include sports stadiums, rubbish dumps and graveyards! These boys could teach the Chinese a thing or two about manipulating the system. The EU Commission have apparently put the blocks on huge tranches of farm aid destined for Bulgaria, until the whole thing gets sorted out. Legitimate Bulgarian farmers have taken to the streets in protest that their bent-as-a-nine-bob-note brothers are preventing real subsidies getting through. It is worth noting that the country produced 4.385mmt of soft wheat in 2008. You can bet your house on it now that they won't be matching that again in 2009 if they're short of cash. eCBOT grains closed mixed with beans around 7-8c firmer, wheat up around 3-4c and corn 1-3c lower. The dollar is sharply weaker ahead of the Fed's anticipated interest rate cut later today. Just after 1pm GMT the pound was at $1.5330, close to it's highest levels in a fortnight. Corn is a little lower on ideas that the late surge after Informa slashed 2009 acres by 3.6m may have been a little overdone. Iraq is in the market for 50,000mt any origin wheat and Japan is tendering for a 62,000mt combo of US and Canadian wheat. Ukraine remains amongst the countries hardest hit by world financial turmoil. It's currency, the hryvnia, is crashing through the floor making it very competitive on the wheat export arena. So too, Russia, with it's ruble devalued twice in the last four days. Both countries have large grain stocks to sell and are keen for the foreign dollars that they provide. Crude seems settled around $45/barrel ahead of the OPEC meeting at the end of the week. Early calls for this afternoon's CBOT session: Corn futures are expected to open 1 to 3 lower; soybeans 8 to 10 higher; and wheat 1 to 3 higher. Germany's Federal Cartel Office, the Bundeskartellamt, has fined Mars Inc. a record 4.5 million euros for having acquired pet food producer Nutro Products, Inc. without it's approval. According to the Bundeskartellamt, the acquisition would have further strengthened Mars' already dominant prescence in the German market for dry dog food. Mars' brands sold in Germany include Pedigree, Frolic, Chappi, Cesar, Whiskas, Kitekat and Sheba. Dunn Commodities Ltd are NOT in receivership contrary to earlier reports. My apologies to Mr. Greg Dunn. It's comforting to know that the Chinese are finally (literally) cleaning up their act on what is, and what isn't, permissible in foodstuffs by banning such wholesome and nutritious products as insecticides, drain cleaners and industrial dyes according to media sources. China's first list of banned food additives issued this week contains substances including boric acid that is not only used as an insecticide but is also added by Chinese food manufacturers to meatballs and noodles in order to increase elasticity. Formaldehyde and lye, which is used in soap production and drain-cleaner, was also banned. The materials are also added to water in which seafood is soaked to make the produce appear fresher and bigger. The list of outlawed substances is the result of an investigation by Chinese officials charges with improving standards in the country’s food industry where the practice of adding industrial chemicals to foodstuffs is rife. The government working group even listed an addictive substance made from the poppy plant and related to opium, which can be used as a painkiller. It is often used in hot pot, a Chinese dish where meat, vegetables and tofu are cooked at the table. Oil World has revised up it's worldwide rapeseed production forecast for 2008/09 to 57.5 mln t from the previous figure of 56.5 mln t and compared to the 49.0 mln t of the previous year. The main producers are the EU with 18.8 (last year 18.4) mln t, China with 11.6 (10.4) mln t, and Canada with 12.6 (9.6) mln. Global use is expected at 54.5 (50.7) mln t and ending stocks at 7.6 (4.7) mln t.
Wordwide rapeseed meal production should reach 30.3 mln t in marketing year 2008/09 (Oct./Sept. ), they say, exceeding the 28.6 mln t produced in the previous year. The main producers of repemeal are the EU at 11.3 (10.9) mln t and China at 7.3 (6.8) mln t.
Global use is also expected at 30.3 (29.6) mln t, thereof in the EU at 11.2 (10.8) mln t, in China at 7.5 (7.0) mln t, in India at 2.3 (2.2) mln t, and in the USA at 2.5 (2.3) mln t.
A dry autumn and it's effects on plant emergence is leaving winter wheat crops in Romania vulnerable to a harsh winter. With farmers there also cutting back on inputs due to financial constraints the 2009/10 soft wheat production is seen 18% lower at 5.26mmt. Similar problems in Hungary, and the unlikelihood that the record yields of 2008 will be repeated, sees Hungarian 2009/10 soft wheat output down 8% to 5.158mmt. Norwegian salmon farming company Lighthouse Caledonia ASA has frozen payments to creditors and asked for it's shares to be suspended on the Oslo bourse today. The company, who's main activities are in Scotland, said in a statement, "a recent reduction in credit terms from one key supplier - with credit time being reduced from 90 to 30 days - caused by the unresolved long-term financing of the company, has resulted in a constrained liquidity situation." The pound was slightly firmer after the November CPI report showed that annual inflation slowed from 4.5% in October to 4.1% in November. The November retail price index was up 3% on the year, against the consensus view of 3.2%. The November retail price index excl. Mortgage interest Payments was up 3.9% on year, against the consensus for a 4% rise. The pound was $1.5230 and 1.1150 against the euro at 9.45am GMT. eCBOT grains are mixed overnight with soybeans a couple of cents higher, wheat down 3-4c and corn 1-2c easier. There's not a lot of fresh fundamental news so far this morning. On the Chinese Dalian Commodity Exchange, soybeans for May delivery fell 1.7 percent to settle at 3,035 yuan ($443) a tonne. The Chinese Ministry of Finance said Tuesday that the country had cancelled it's value-added tax on soybean exports. Japan is tending the market for 62,000mt wheat, a combination of Australian & US, in a tender to be concluded Thursday. The harvest in Australia is slowly grinding on with analysts now estimating that it could take until February to wrap up due to persistent heavy rains. Morgan Stanley forecast corn will average $4.50 a bushel in the year to Aug. 31, down from $5.50 estimated in October. Still, that is significantly higher than current levels. Crude appears to have settled into a trading range in the mid-$40's ahead of the OPEC meeting in Algeria later this week. The dollar is at two-month lows against the euro on speculation the Federal Reserve will reduce interest rates to a record low later today. The pound is at $1.5240, and hasn't even got around to setting a record all-time low against the euro yet today at 1.1156. The latest UK inflation figures are expected to show another sharp drop in the rate for November. Economics predict that inflation, as measured by the government's preferred Consumer Prices Index, will have fallen from 4.5% in October to 3.9% or less. The FTSE100, CAC40 and DAX are all up a tad in early trade. As the recession bites and consumer spending slumps more High Street names are feeling the pinch. Kesa Electricals has reported a half-year loss at UK chain Comet, with sales falling because of "extremely difficult" trading conditions. For the six months to 31 October, Comet made a loss of £8.1m, compared with a profit of £10.6m a year earlier. Carpetright, Britain's biggest carpet chain, warned annual profits would be "significantly" below City expectations as it reported a 67% fall in first-half profits and slashed its dividend. EU wheat futures closed slightly higher Monday in relatively quiet pre-holiday trade. Paris March milling wheat futures closed up EUR1.75 at EUR128.25/tonne. London May feed wheat closed up GBP0.75 at GBP98.50/tonne. The devaluation of the Russian ruble, twice in the last three days, keeps Russia hungry for foreign currency. With it's largest grain crop since the early 1990's the country has plenty of grain to export and price is becoming almost secondary. However, with winter weather closing in, there may be a window of opportunity for European wheat to re-enter the export arena. The continued weakness of the pound is helping support UK wheat, thank God, because little else is. Further forward, the EU-27 wheat crop for 2009/10 looks like being lower in virtually all producing countries. Small losses in France and Germany look like being compounded by significantly larger losses in the UK, Spain and elsewhere. Production in the FSU countries like the Ukraine also seems likely to be significantly reduced. Despite sharply higher global production in 2008, stocks remain historically tight, with lower plantings and yields anticipated in 2009/10, the world still remains vulnerable to a serious weather problem somewhere next year. Corn futures closed 1 to 2 cents higher Monday. The US Dollar stumbled lower again Monday creating buying interest across the commodity board and helped push CBOT corn futures higher. Private firms are estimating several million acres swing away from corn. USDA inspected 29.3 million bushels for export last week which was better than trade had estimated of 22 -26 MB. Initial rallies in crude oil and a softer dollar supported grains throughout trade on Monday. Trade may be starting to trade acres as Informa released their projections of 82.2 million acres, which is about 3.5 million off of 2008 bad about 10 million acres from 2007. Deliveries issued against the Dec ?08 contract (expired) were 136. Mar +1 at 3.75. Soybeans backed off of midday rallies and closed several cents lower. Corn/Bean spreading was noted pressuring soy prices lower. Soybean crushings were their lowest since 1996 for the month of November at 139.4 million bushels. USDA reported export inspections of 34.4 million bushels of soybeans last week, but was slightly below trade guesses of 35-40 MB. Beans received some underlining support from the outside markets but fell as crude oil erased daily gains. Regions of Argentina and Brazil still remain severely dry and will need moisture to boost growing crops, also to aid soil moisture to any unseeded plants. Informa Economics released there estimates of planted acreage Friday, suggesting farmers will plant 5.55 million more bean acres than they did in 2008, for a total of 81.45 million acres, the increase in acres may limit upside potential as supplies should increase. Jan -8 at 8.46 Jan Meal -.90 at 256.80 Jan BO -37 at 30.55. Wheat futures were mixed at the different exchanges Monday when the closing bell rang. Gains were noted in most CHI and KC contracts but spring wheat closed marginally lower in the front month. Wheat futures were boosted by higher CBOT corn and a weaker dollar. Deliveries issued against the expired Dec contract were 107 contracts. USDA reported export inspections of 12.3 million bushels below trade estimates of 13-17 million bushels. The softer tone in the dollar is lending support to wheat exports and futures. Iraq has issued a tender to purchase 50,000 metric tonnes; additional tenders are expected to be announced later in the week. Dormant winter wheat could be threatened by winter kill as temps across northern plains reach well below zero degrees Fahrenheit. Mar CHI +7 at 5.20; Mar KC +4 at 5.43; Mar MLPS -1 at 5.89. Today's latest fresh all-time low for the pound against the euro is 1.1089, with one euro breaking through the 90 pence mark today for the first time ever. Sterling has now dropped around 13 per cent against the euro in the past two months as the Bank of England has slashed interest rates faster than the ECB in its attempt to stave off a deep and prolonged recession. Things could get worse later this week, new figures are expected to show that UK unemployment is worsening, increasing from 5.8 per cent to 6 per cent, while the number of people claiming jobless benefits is forecast to have risen by 45,000 in November. Russia’s central bank devalued the ruble for the second time in three days Monday, but not before blowing $161 billion trying to defend the flagging currency. The huge fall in the price of crude oil since the summer highs has drained 27 percent of the country's reserves, the world’s third-largest, trying to stem a 16 percent decline in the currency against the dollar. It is possible we will see two to three more devaluations this week, said one analyst. Prime Minister Vladimir Putin’s pledge to avoid a “sharp” devaluation of the ruble and let the currency fall gradually has dissuaded citizens from storming banks to remove deposits as they did in 1998, when many lost life savings as the ruble plunged 71 percent versus the dollar and the government defaulted on $40 billion of debt. Standard & Poor’s downgraded the nation’s sovereign debt to BBB, the second-lowest investment grade rating. It's no surprise therefore that Russia is so aggressive on the grain export market at the moment, nor that it is keen to help OPEC out in achieving it's targets re the price of crude. eCBOT grains closed higher across the board Monday, with beans up around 17-18c, wheat 11c higher and corn up 8-9c. China has asked state reserves to buy as many as 3 million tons of soybeans from domestic farmers to boost prices and rural incomes. That’s made processing domestic soybeans unprofitable and forced buyers to turn to buying cheaper U.S. and South American beans. Purchases may total 2.9 million metric tons, the Ministry of Commerce said in a twice-monthly forecast report dated Dec. 12. That compares with 1.4 million tons in December 2007, according to customs data. Chinese buyers may have ordered as many as 23 cargoes, or about 1.4 million tons, of soybeans in the 10-day period ended Dec. 12 for delivery in January and February, according to sources. Lower estimates of US plantings of wheat and corn for 2009, released by a private research firm on Friday, are also encouraging for prices. Informa Economics Friday dropped 2009 US wheat plantings by 2m acres on 2008, and corn by more than 3.6m acres. The USDA chief economist recently pegged 2009 US corn plantings at 90m acres, the Informa number is over 7.5m acres lower than that estimate. Informa said that virtually all of these lost acres will go into soybean production, raising 2009 planted area by 5.6m acres to 81.5m acres. Meanwhile crude oil futures climbed over $48 a barrel as investors anticipated hefty output cuts by OPEC producer countries at a meeting later this week. Commodities and equities also reacted to renewed hopes about a bailout of U.S. automakers, and expectations of an interest rate cut of 0.5% from the US Federal Reserve later this week. The dollar hit a two-month low against the euro on the outlook for lower US interest rates, boosting hopes of increased export activity. Early calls for this afternoon's CBOT session: Corn futures are expected to open 7 to 10 higher; soybeans 16 to 19 higher; wheat 9 to 12 higher. The Brazilian 2008/09 soybean crop is 92% planted as of Dec 11 according to AgRural, slightly behind last year's pace of 95% done. The private consulting firm estimates final 2008/09 planted area at 22m ha producing a crop of 61.8mmt. Mato Grosso state, Brazil's No.1 soy producer, has finished planting its soy for 2008/09, the firm said, whilst plantings in Parana, the No. 2 soy growing state, were 97% done. Dry weather is still a concern however, despite some rains last week, the number of fields in good condition falling to around 66% from 86%, the firm said. Associated British Foods plc, the international food, ingredients and retail group, has today announced that it has reached agreement with Ebro Puleva S.A. to acquire its Spanish sugar business, Azucarera Ebro S.L., for a value of Euro 385m. Completion of the transaction is subject to regulatory approval and is likely to occur in early 2009, they say. UK wholesale milk deliveries totalled 982.2m litres, 31.8m litres down on last year and the lowest level November 1974, according to latest Rural Payments Agency figures. Cumulative production for 2008/09 now stands at 8,635m litres, 229m litres down on November 2007. "It's a harsh reminder of the pressures and lack of confidence on dairy farms at the moment," NFU chief dairy adviser Hayley Campbell-Gibbons commented. It appears that the British taxpayer is exposed to the newly outed Bernard Madoff biggest scam of all-time, after the RBS admitted that it had an exposure of £400 million in the ruse. The potential loss is another blow to the beleaguered bank, which is 58 per cent owned by the Government after it accepted £20 billion from the taxpayer as part of the £37 billion bailout of British banks. HSBC said it may have a potential exposure of about $1 billion from loans made to funds investing in Mr Madoff’s venture. May have??!! Don't they bloody well know? Heads should well and truly roll over this fiasco. These muppets are getting bailed-out for their inefficiencies with taxpayers money & 'investing' it in crap like this rather than lending it to us! And another thing, what are the Septics doing allowing this sort of thing to go on so long? 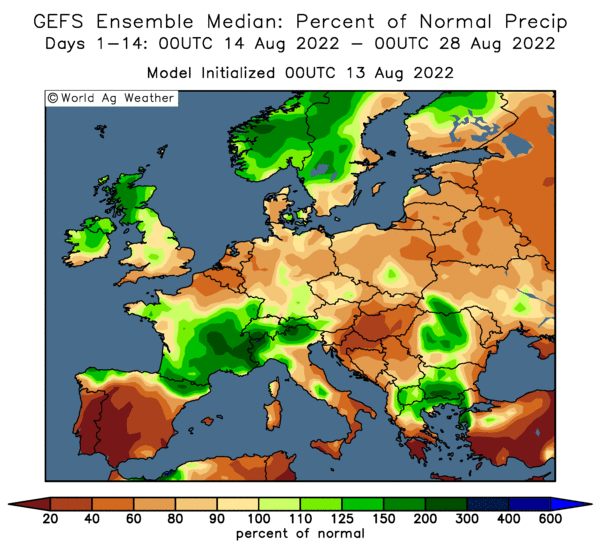 First estimates are now filtering through on the estimated planted area and output for soft wheat in Europe's leading producing countries for next season's crop. In France, the EU's No.1 producing country, planted area is estimated at 5.03 mln ha which is 0.5% below the 5.06 mln ha in 2008/09, according to the French Agriculture Ministry (Agreste). ONIGC estimate plantings 0.7% lower at around 5 mln ha. Ouput is estimated around 1% lower on the current season at 36.9mmt. In Germany, Europe's second largest producer, the size of the 2009/10 soft wheat crop is estimated at 25.282mmt, 2.7% down on the current season, with a slightly lower yield of 7.88mt/ha estimated. The UK is the third largest producer in the the EU. Here output is seen at 16.015mmt next season by Strategie Grains, that's a drop of 8% on the current season. No estimates are yet available for output in the fourth and fifth largest producers in the EU-27 during 2008/09 (Poland & Hungary). Soft wheat output in Spain, the sixth largest EU producer in 2008/09, is seen 15% lower at 4.712mmt. eCBOT is firmer across the board with beans, wheat and corn all up around 10-14 cents. It seems that the "fight for acres" in the US next season has already begun after Informa slashed their projected corn acreage numbers by 3.6m acres late Friday. Chinese soybean futures were higher Monday, led by strong gains in soymeal prices as feedmills build up their stocks ahead of the year-end holidays. The Chinese government is holding onto it's wheat stocks, selling just 294,593mt on the domestic market last week, at this time of year the government would normally auction off around 1mmt/week sources say. Rabobank has cut it's Australian wheat production forecast by 1mmt to 19.5mmt. The barley crop there has been hit by a mystery fungus. Just vefore 9am GMT the pound is at $1.5022 and 1.1170 against the euro. In early trade the pound hit it's fifth record low against the euro in succession. This time the magic number was 1.1124. One euro is now worth 89.5 pence, with seemingly more record lows lined up for the rest of the week. Crude is slightly easier at $46.01/barrel on signs of falling Chinese fuel demand amid economic contractions in the U.S., Europe and Japan. 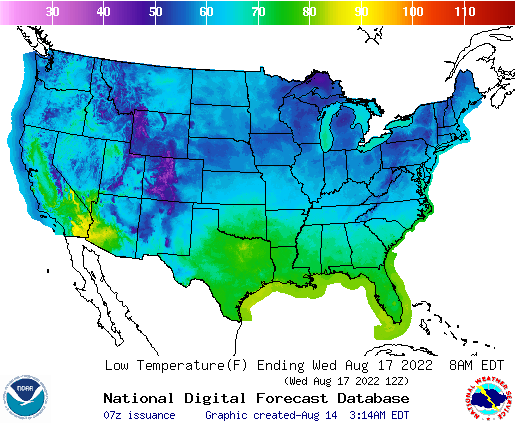 It is however comfortably off Friday's lows after Pres. Bush announced that he is not prepared to let GM, Chrysler and Ford go to the wall. He will dip into the $700 billion TARP program funds if necessary, he said, in what appears to be a short-term measure to stave off bankruptcy before Obama gets the hot seat. OPEC meet at the end of the week to discuss exactly how big a production cut os needed to shore up the price of crude. Non-OPEC member Russia has indicated that it would also like to join the party. Premier Foods has confirmed reports in the Sunday press that it is seeking up to 700 million pounds from investment banks and private equity groups. The head of Barclays bank has predicted that economic gloom will deepen, with UK property prices falling by up to 30%. Swedish company, Electrolux, the world's second biggest home appliance maker, is set to axe 3,000 jobs after warning it will miss full-year profits targets as demand for its goods in Europe and the US tumbled in November and December. The FTSE100, CAC40 and DAX are all modestly higher in early trade with the FTSE up 0.65% to 4308.16. Irish police are said to be investigating the theory that smuggled fuel may be behind the recent dioxin scare that led to a massive worldwide recall of potentially contaminated Irish pork products. One theory is that the fuel, thought to have originated from County Tyrone in Northern Ireland, was of a contraband type that is converted from agricultural green diesel to red diesel. The conversion process produces dioxins as a by-product. A second hypothesis is that the fuel was legitimately sourced but contaminated after being transported in a tanker that contained dioxins. Irish police said that there was no suggestion the firm behind the incident, Millstream Recycling based in Co Carlow, had undertaken any illegal activity. As the size of the EU-27 2008 corn harvest has finally become clearer, Coceral have increased their estimate for final 2008/09 EU grain production to 310.6 million metric tonnes, from the September estimate of 306.2 million tonnes. The 2008 EU-27 corn crop is now estimated at 60.8 million tonnes, up from September's figure of 57.7 million tonnes and up a whopping 49% on the year. Soft wheat production was tweaked up slightly to to 141.1 million tonnes, from September's forecast of 140.7 million tonnes, up 26% on the year.